John Boyett is now safely eligible to be arrested. 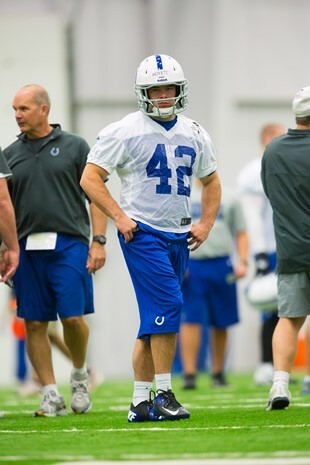 The sixth-round draft pick, who protested to police about being arrested because of his status as a paid Indianapolis Colts employee, now has been released, the team announced this morning. The Colts had been keeping him on the reserve/non-football injury list. The police report stated Boyett was denied entry to a bar for being too intoxicated and then threatened to break an officer's jaw. Boyett then tried to flee and after he was caught, proclaimed, “You can’t arrest me, I’m a Colts player." With Boyett's release Tuesday, both of those statements now are false. "I want to apologize to Mr. Irsay @JimIrsay , the Indianapolis Colts organization @Colts and the Indianapolis police. The Colts gave me an opportunity and I blew it. My behavior didn't and doesn't represent who I am. I am deeply embarrassed and disappointed in myself. All I can do now is learn from it and never repeat it. I look forward to showing my true character in the future." Hit us up on Twitter @YShutdownCorner, email us at shutdown.corner@yahoo.com and "Like" Shutdown Corner on Facebook for NFL conversation 365 days a year, the way it should be.